Recently, I was settled in a dark corner of the State Historical Society of Missouri (Columbia, Missouri) focused intently on the screen of a microfilm reader, trying to decipher badly focused text of a yellowed 1933 newspaper, when a voice penetrated my fog – “Crystal Payton?” The voice belonged to Sean McLachlan, pelagic and prolific, self-designated “Midlist Writer” who actually resides in Madrid Spain. My mental jump from 1933 to 2010 took a couple of minutes, but the brain finally locked in. Pretty remarkable crossing of paths … Sean is in Columbia for a couple of weeks to research a new Missouri book – this one on Gen. Joe Shelby’s 1863 raid into Missouri from Arkansas; his other work in progress is on Ethiopia. His interests are global (travel) and local (he’s got a new series on Missouri’s own Jesse James) – and we meet on the playing field of Missouri regional history! My date with microfilm was to advance our research into the background and politics of the building of Harry S. Truman Dam and Reservoir on the Osage River. Between the Great Mississippi River Flood of 1927 and the closing of Bagnell Dam on the Osage in 1931, the Corps of Engineers overcame their resistance to the concept of dam/reservoir projects for flood control. They were looking for dam sites in the early ‘30s and haven’t changed that mindset since. So the reels of “The Clinton Eye” a weekly paper in the county seat of Henry County we felt might hold early gems. Worth a look-see, anyway …. FYI – the new book is The Osage River: paddlefish, prairies, farms & villages, dams & reservoirs, imperial Indians, explorers, slickers, sportsmen, tourists & various violent, litigious & noteworthy events in the history of the Osage River Valley. Right now we’re looking at 300+ well laid out, color illustrated pages. (above) Leland looks over the Osage River valley from a bluff off Highway 17, east of Tuscumbia. The view is toward the abandoned Henley railroad bridge. Catching up included sending Sean a copy of On the Mission in Missouri and Fifty Years Ago: A Memoir, which we published after Mystery of the Irish Wilderness. Father Hogan’s account of life on the rapidly settling Missouri frontier and through the Civil War in northern Missouri is a lively read by itself. His recollection of growing up in County Limerick, Ireland in the 1830s and ‘40s is a real snapshot of the times leading up to and the beginning of the Potato Famine. We couldn’t just leave them on the shelf … so this volume contains both memoirs and the biographical information I gleaned from diocesan archives. I can’t wait to read your Osage River book. I don’t know why you would be interested in this, but I work for Missouri River Relief – we’re a river clean-up organization that has done some work on the Osage River. For the past three years, we’ve done a clean-up at the Mari-Osa area (where the 50/63 bridge crosses the Osage east of Jeff City). We’ve been cleaning up a over 100 year old dump there. At the time we tried to get some interest from local historians and archeologists, but probably asked the wrong people. Anyway, this dump, which was probably a treasure trove of random information is now mostly cleaned up. Thanks for the link to your Web site. We’ll certainly let you know when the comes out. 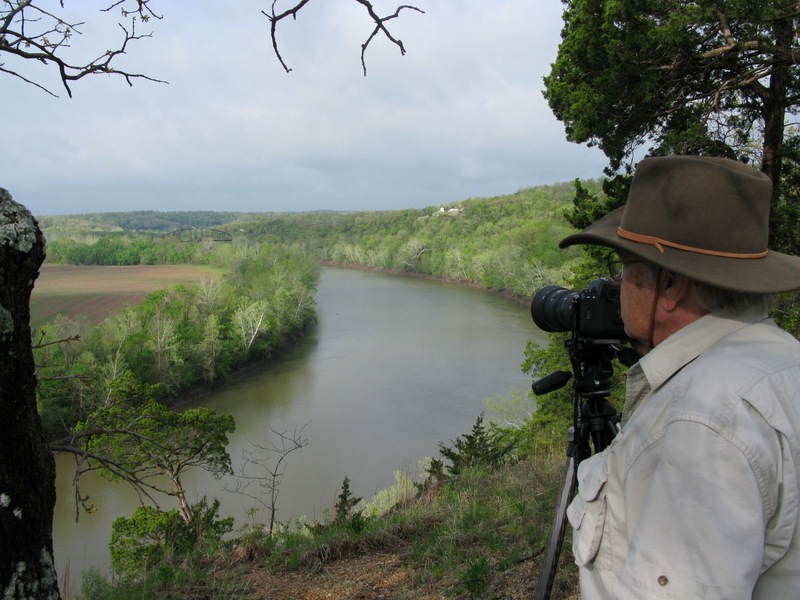 There are many reasons for a book on the Osage River. Even though there’s not much left of the Osage after Truman and Bagnell dams, the remaining 80 miles of river below Bagnell certainly deserves more respect that it gets. What’s left of the Osage may not be as splendid and picture-postcard attractive as the Current River, but it has a richer human history than the clear, deep Ozarks streams. The Osage is attractive too – even in places spectacularly so – with its bluffs and views of pastoral valleys. This book, we hope, will also be a provocative shot to get people discussing water resources. The Osage River: research trip to Heritage Days in Warsaw, Missouri.